Boris was born in St. Petersburg and has lived there for all of his live save two years. It is his favorite city. He joined the LDS Church in 1993. 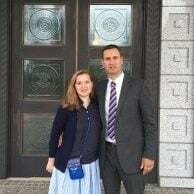 He was a full time in Rostov on Don in Russia mission. He has served as district young men’s president, branch president, member of the district high counsel, counselor in the stake presidency, and currently serves as Stake President of the St. Petersburg stake. Boris began working as a doorman in five star hotels. In 2005 he started his own tour business showing off St. Petersburg and now he does his “side business” full-time. He is the owner of the St. Petersburg Tour Company. He arranges all kinds of tours around St. Petersburg and Russia. Cruise Lady is happy to use him whenever we are in Russia. Boris is married to the most beautiful girl in Russia, they have four children.